A new highly realistic sculptural portrayal of Gianna Beretta Molla captures the dramatic moment of a life and death decision. 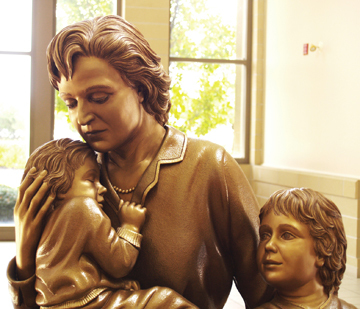 The full round life size, cold cast bronze sculpture was installed in the narthex of St. Matthew’s Church in Oakville, Ontario. The highly technically demanding feat took almost a year to perfect. It was sculpted by Canadian artist Achim Klaas, who a year earlier, presented one of his sculptures to the current Pope. Gianna Beretta Molla was an attractive woman, physician and mother. She enjoyed the outdoors, was passionate about her husband, nurturing and loving toward her children and was uncompromising with her patients. In 1962 during the pregnancy with her fourth child and due to a rare medical condition, Gianna was faced with a stark choice. She made a quiet, heroic decision, one which she understood thoroughly as a physician; her life or the life of the unborn child. In 2004, the Catholic church proclaimed her a Saint on the basis of this choice and the miracles attributed to her. Pope John Paul II called her “a simple, but more than ever, significant messenger of divine love”. As Gianna’s family enjoyed many outdoor activities, the artist chose to depict Gianna with her three children engaging in a picnic. The sculpture draws the viewer into the moment through the natural setting and the many uncompromising details. There is an air of psychological gentleness. It captured the critical pivotal point of life and death in this dramatic human story. Gianna’s face and gesture reveals her overriding love while making the crucial decision which would affect the lives of everyone in her family.. 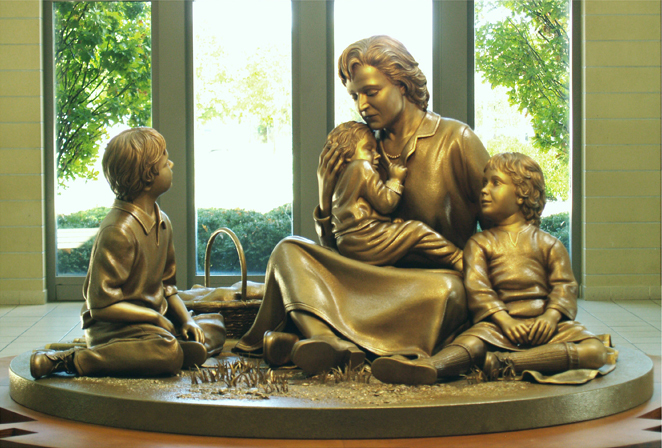 The sculpture is different than most liturgical art. It represents a dramatic break from traditional church sculpture. It tells a touching human story. Its subject matter, the nature of the highly realistic style with the incredible details and the psychological analysis the artist was able to capture, creates a relevancy for our times in which the viewer is drawn into. 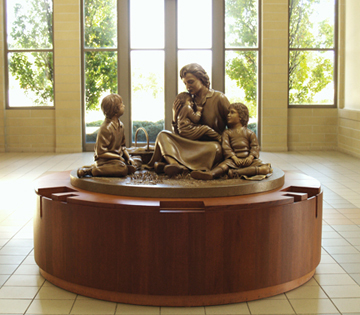 This sculpture grouping was recently dedicated and blessed in Fall of 2011 by Bishop Douglas Crosby of the Diocese of Hamilton, Ontario.